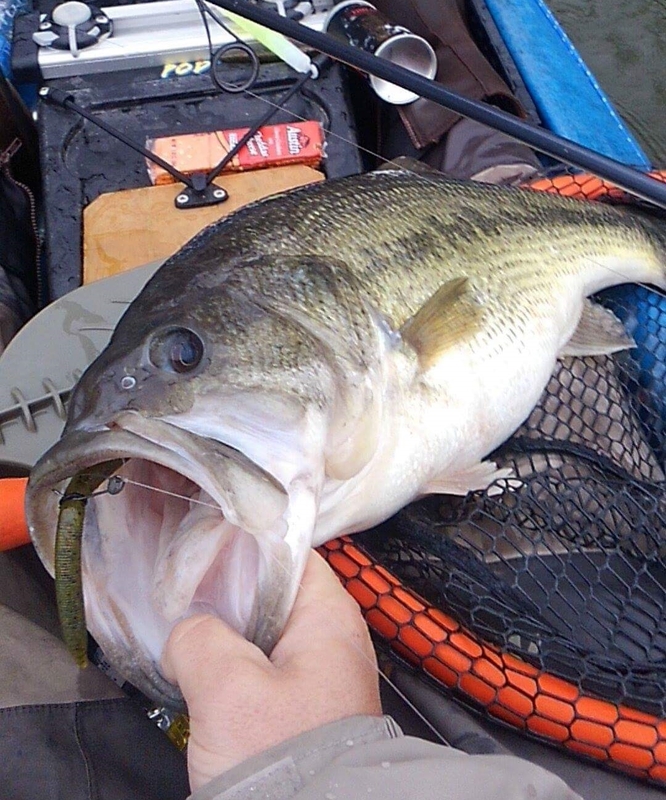 Bass fisherman are creatures of habit. We like to throw certain baits because we consistently catch fish on them, but how often do we think about throwing something different just to give the fish a different look. In 10 Days in June, I caught over 80 pounds of bass. Most of them were small but my 5 fish bag consisted of a 3.5 pound fish, a 5 pound fish, two 8 pound fish and a 10 pound kicker. This post is going to cover how I found a small pattern and then built upon that pattern to zero in an afternoon of fishing that resulted in two 8 pound fish and 20 fish total. I knew there would be a topwater bite in June, so I started with the most basic topwater lure in existence. The Booyah Boss Pop in a translucent white produced fish, including a 3.5 pound fish. But the bite wasn’t incredibly aggressive and it was mostly fish that were within 5-10 feet of the initial cast. So after that I threw a 90 series Whooper Plopper in the Loon (black) color with a few good fish but nothing over 3 lbs until I smashed it against a bridge and broke my only Whooper Plopper. The next evening I was fishing when a heavy rainstorm moved in and I switched to a buzzbait because I felt like the Boss Pop wasn’t making enough commotion to stand out from the surface clutter made by the falling rain. This switch only produced 2 fish, but one was a 24.00″ 10lb monster bass. So I made a note that the bigger fish wanted a faster moving bait than the popper style lure. 2.) Observe every detail of the water, bait, and fish strikes. During the buzzbait phase of the pattern I noticed fish following the bait, I mostly observed this because the fish push water behind the bait. It almost looks like your bait is throwing a larger “Wake” than normal and then it will disappear. After about 5 “followers” into the next day I decided to switch to a Stanley Ribbit. This bait is similar to a buzzbait in that it creates a lot of surface commotion, however there is no flash and no metal. This bait looks very natural and can be retrieved much slower than a buzz bait. For 3 Days this lure produced 20 strikes per trip and landed roughly 5 fish a day including a 5 pound bass. One huge takeaway from this was that the strikes were coming in lay downs and next to stumps. So the fish were shallow but holding within a foot of hard wood/cypress objects. I also noticed that there was a lot of small bait fish near these holding points and the bass were chasing after them extremely aggressively. 3.) Understand that fish are far more aware of lures than you think. I normally will find a bait to produce huge numbers and then after the 2nd or 3rd trip the bite will die off. This is because I fish a lot of the same water, the fish see this lure and eventually the larger, more intelligent fish won’t even move themselves to look at it. Now take a second to think about this. In heavily pressured water these fish see a lot of baits, but most importantly they see a lot of generic baits. For example, in Eastern North Carolina, almost every fisherman has three baits he/she is fishing. They normally consist of a 1.5 Square bill, a Carolina rigged trick worm in bubblegum pink, and a white/chartrueese double willow spinner bait. They throw these lures because they consistently catch fish. But more importantly for you to pay attention to, is they consistently catch 1-3 pound fish with an occasional 5 pound kicker. Whooper Ploppers have also begun to make a huge impact in topwater fishing, but it’s very important to notice where people fish the majority of their casts which brings us to our next point. 4.) Never assume water doesn’t hold fish. You will always hear people say, “I never caught a fish over there”, That’s to shallow for a bass to be in”, or my favorite, “you’ll never catch a fish fishing over there”. I can honestly say that every single fish over 8 pounds that I have caught was in less than 4 feet of water and all of them were in structure so tight that they wrapped me around limbs and logs, with my biggest a 10.5 pounder being in water so shallow that when the wind blows from the NE it’s dry ground. Big fish are big because they have avoided capture from fisherman and natural predators, bass spend most of their lives in a survival mode mixed in with feeding frenzies. So pay attention to water that is overlooked or considered a waste of time, Because that’s generally where you will catch a lunker. 5.) Putting it all together. So here is the information I had. 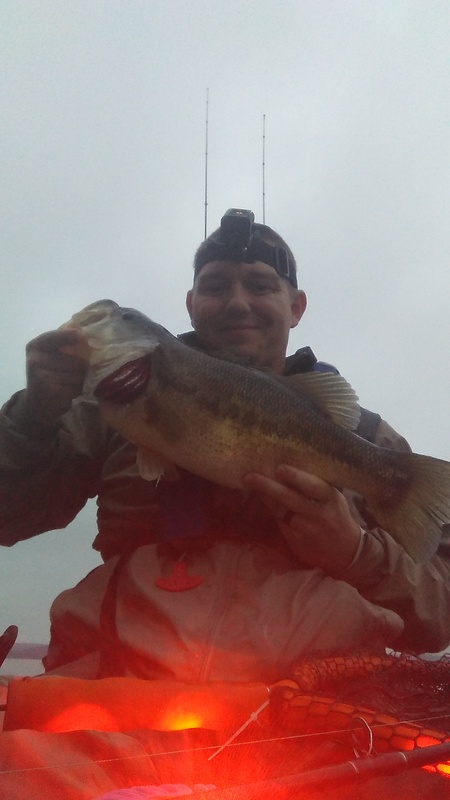 I caught a few fish on a light colored popper, a monster on a white buzz bait, a few good fish on a black whopper plopper and a really good bite on a Stanley ribbit. I made my way to the tackle store because I was out of Ribbits and I was going on my last afternoon fishing trip while living in North Carolina. I just so happened to glance over at the Whopper Plopper’s and noticed he had gotten a Bone 90 Series in stock that day. And I started putting together the puzzle pieces. The whiteish popper produced decent, a white buzbait got the bigger fish active, and the ribbit was a great bite but only with the watermelon color that had a pearl belly. They didn’t touch the orange or reddish white bellied Ribbits. I took a chance and got the bone Whopper Plopper. It had the best features of every lure that was successful over the last 2 week. The white/pearl color, the medium to slow speed retrieve with the surface disturbance very similar to a ribbit and most importantly it had the profile of a bait fish. I took a chance and bought it, and headed out for my last evening of fishing in the state after 6 years of active duty service there. By selecting a bait that had the best features of everything I was observing happen to my lures, and focusing on the shallow wood that every other angler was discarding as trash water i put my plan together. I set out at 4pm on a Thursday and within the first 30 minutes I had over 10 strikes and landed a 8 pound bass that was so close to wood that I heard the lure impact the stump and then saw the strike. I continued down the creek extremely excited that I had zeroed in the fish and found a section of water that was a natural point with a large cypress tree surrounded by limbs and cypress knees. The problem was it was 1 foot or less of water and surrounded by heavy swamp moss. I casted well beyond the tree and retrieved the lure straight through the structure and witnessed what looked like grenade going off. One of the worst feelings is knowing you have a lunker on the line and seeing the fish jump in a direction away from where your rod is pointing. This means you are wrapped around something and the fish has a 90% chance of breaking your line and crushing your soul. I fought the fish around the limb and was able to work it free and eventually land it. A 8.3lb lunker! I ended up finishing the evening with 20 bass and an easy 30 strikes. I had the best afternoon of fishing in my life because I observed the fish and their reactions to my lures for 2 weeks. I broke down the information I observed into specific details and adjusted my approaches based of off those findings. I enjoyed the results of zeroing in a bite to a pin point and catching a 36 lb bag over a 10 day period becuase i did what most anglers would call over analyzing everything. But any experienced angler or tournament fisherman will agree that there isn’t such a thing as over anlayzing when it produces fish. In conclusion You need to find the basic building blocks of the current pattern, what they are eating, what they are responding too, and how you can change your presentation to mimic that specific reaction. Then slowly build upon that and observe how the fish change accordingly. Finally take everything you have learned and build a puzzle of your information and seek out waters that are often overlooked or discarded as waters that don’t produce big numbers. I hope this post helps shed light on the aspects of finding a specific aspect of a pattern and catching lunkers based on it. Good Luck out there and stay safe! Enjoy the video below of the 5 fish bag and 3 lunkers! The 2017 Kayak Bass Fishing National Championship was an event I had been chasing for two years. Qualifying for this event was especially challenging for me due to a number of deployments throughout the summer and fall of 2016. The KayakTournaments.com online trail awards one qualifying spot for the state of North Carolina for its Angler of The Year program. I finished 9th out of 31, but the anglers above me consisted of names such as Cory Dreyer, Jamie Denison, Jimmy Houser and Larry Anderson. The North Carolina AOY program was stacked with legitimate powerhouse fisherman, all of whom had qualified previously through other KBF sanctioned events. So, through some miracle, the qualifying spot rolled down to me sitting in 9th place. Needless to say, I was out of my league and felt slightly intimidated by the fact that I shouldn’t have really qualified for that event if it had not been for the roll downs. Regardless of the daunting task of competing against over 360 of the top kayak anglers in the country, I based my preparation on analyzing the lakes depth charts, using Navionics software, and reading into over five years’ worth of fishing reports for the historical periods of three weeks before the tournament dates and three weeks after to get an idea of consistent patterns. This tactic proved absolutely invaluable as it really helped me pick a spot I knew could produce good five-fish limits on consecutive days and not burn out after day one. I pre-fished for four days leading up to the National Championship, and I started off at the Ken-Lake Marina. There were a couple of different lake features I wanted to target, and that launch had access to all of them. Day one ended with about twenty bass caught all in the 9 to 13 inch range, but more importantly it gave me confidence in my lure selection, and I noted where in the coves I was catching fish. (Marking those fish led to a major breakthrough after day three). 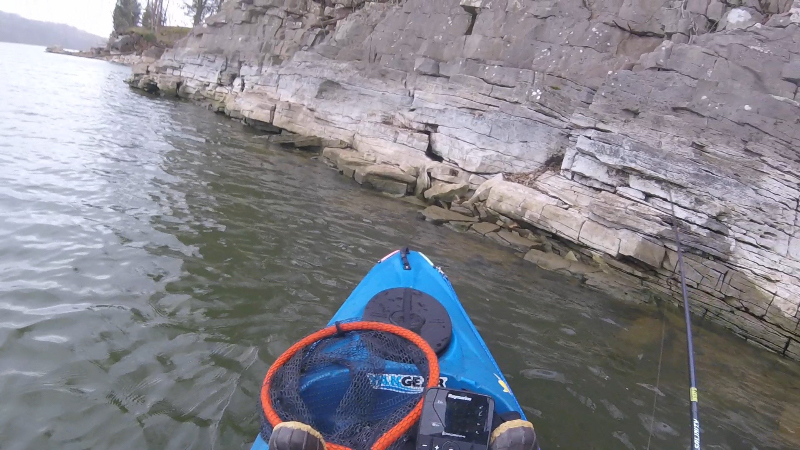 On day two, I launched from a ramp a few coves south of the 68 bridge. I landed a 22-inch beast at first light on a tandem willow Strike King spinner bait, the fish crushed it as it came over the drop off about twenty feet from the bank. (Another note for day 3) I worked my way south into a few coves and old creek beds and ended up again with about fifteen fish averaging 9 to 13 inches, I gained more confidence in my first two days fishing -this huge lake has produced over two dozen bass, but more importantly, I marked the fish I caught and noted their positions for my analysis before the two competition days. For day three, I changed up my launch location and set out in Sugar Bay, on the east side of Kentucky Lake. Sugar Bay is a very popular spot and within an hour of sunlight I counted six kayakers and over twelve bass boats in that bay. I fished it for about three hours, but quickly realized that this spot would be ineffective during competition days and on the weekend due to a huge number of kayaks and boat traffic. I packed up and moved north to a much harder-to-access launch. I piddled around and caught about four fish averaging 13 inches and marked their positions. Then around 3pm, I stumbled across a spot that looked very promising. It had everything – sharp drop offs, a ton of deep water and a spawning area in the back of the cove, but more importantly it has a ton of jetty material, or rip-rap that has a consistent sloping drop off. (Remember that for later). Day four was the last pre-fishing day, and was forecasted as severe thunderstorms throughout the day. I launched from my Day two spot as it was very close to my cabin I was staying at with a group of friends, and I had caught a large fish a day before the Heroes On The Water Big Bass Brawl had started. My only intention was to target big fish in that area. The weather ended up holding off until about 2:00 PM and I didn’t have any luck catching fish big enough to enter into the big bass competition. I stayed away from my day three spot to save it for competition as I knew there was more there than what I saw. The night before the competition was a funny night at the cabin; we rented two cabins and had about twelve guys total. All of us were digging through our charts and pre-fishing information to determine where we would fish. I was very torn because day one and day two produced great numbers of fish on the southern shorelines in coves running east to west, but day three had larger fish in an area that ran north to south but had similar bottom features and lake structure. I took a chance and committed to my day three spot. I knew there had to be bigger fish active in the morning that were less active when I pre-fished it at 3pm. This decision, or at least a commitment to that tactic, paid off in a huge way. All week I had been throwing finesse baits hoping that the weather system that hit the night before competition would produce fish on those two competition days. For the first day of the KBF National Championship, I launched from the ramp at 4:55 AM, and paddled through the darkness to my fishing area I had picked, it was a gamble as I had only fished about 20% of that area before stopping early during pre-fishing to not over fish it. The alarm for 6:30 AM went off and I started fishing, the morning started out incredibly slow, the first 45 minutes netted 2 fish at 10 inches, not exactly what I was looking for. But between the hours of 7-8:30 AM I landed five fish from 13.5 inches to a whopping 21.5 inch 7lb beast! I knew I had a chance as at 9AM I was sitting in the Top 10 with a lot of fishing left in the day. The bite slowed considerably for the rest of the day and I caught decent fish but was unable to cull a 13.25 and 13.50 inch fish, and lost two quality 18 inch fish, which would come back to haunt me in the Final Standings. I finished day one of the tournament with 83.50 inches and in 62nd Place. The margin of length from me at 62nd and 5th place was 10 inches, in other words 2 inches a fish (Not Much). I knew day two would be the difference maker in terms of whose spots could produce quality stringers on consecutive fishing days. I knew I couldn’t win, but my goal was to finish in the top 100 and I knew my spot still had quality fish ready to catch for day two. It started off great. I changed my presentation slightly and caught a fish on the second cast of the day at 6:31AM. By 6:45 I had a fish five limit with the biggest at 13.5 and smallest 8.5 inches, nothing crazy but I was ecstatic that the fish were so active. 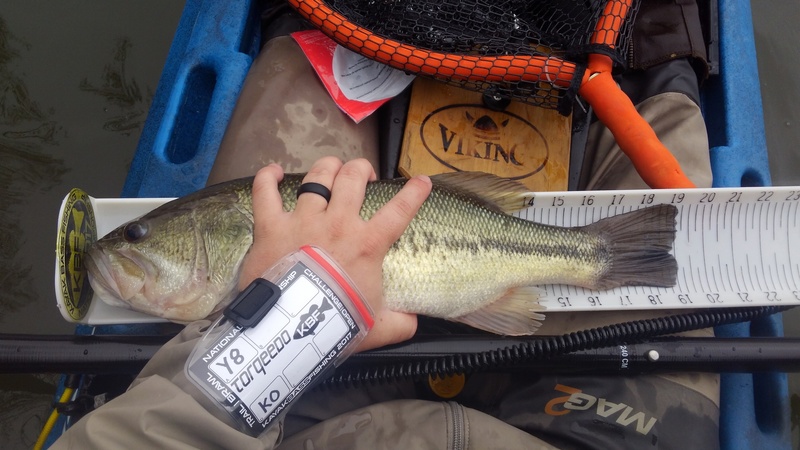 For the next hour, I struggled to catch a fish big enough to cull the 8.75-inch dink on my TourneyX board, I was one heartbeat away from panic mode as the bite slowed down and fish became less active just like the previous day. I made a game time change and switched back to my finesse approach from the day before and on the second cast landed a 15-inch bass. I knew I had found something in that approach and continued to work the cove over again using the new approach and within an hour had a 78 inch total that had me in the Top 5 for Event Total at 9am. I wanted to break 80 inches on consecutive days and I knew I had 4 hours to cull 2 fish. My culls were a 14.25” and a 14.50”. I worked into a new area of the bay/cove that I hadn’t worked the previous day, and over the next four hours I caught six fish, none of which were smaller than 15 inches. I was able to cull my two fish and bring my smallest to 15.50” and total to 84.75” The final day of competition I finished in 40th place with 84.25 inches. The big factor in my placement was consistency. Many anglers who were in the Top 25 after day one, struggled day two and fell considerably in the final standings. Waiting on the announcements for final standings and prize winning placement was brutal. There was confusion with some aspects of the scoring system and the process of re-submitting fish and comparing scores across two tournaments ran until about 3AM the next morning, I did end up finishing in the Prize places in the Heroes On the Water Big Bass Brawl, I finished 19th of 294 anglers and won a brand new NRS Chinook PFD in a new color that had just been released – valued at $100.00. I also won two raffles, which is crazy considering I haven’t won a raffle in my life. I will be donating the one of the raffle items as well as some new gear that I never used to the Heroes On The Water program. If you aren’t familiar with them please check them out, they are a great organization that focuses on taking veterans and wounded veterans fishing to help them get through certain situations they are battling in life. When the final announcements on placements came out I had been awake for 24 hours, and had done everything from fishing the one of the best bass lakes in the country, to hearing Gene Jenson sing wedding songs to Chad and Kristie Hoover, to seeing Mike McKinstry run around with a life size sasquatch. They called out 36th place, the bottom payout slot, at 168.50 inches, I knew I finished with 168.25 total and knew I had missed a paycheck by a quarter of an inch, a margin that one of those 18 inch bass I lost on day 1 would have catapulted me into the top 25. I was heartbroken in one aspect, but on another note I was incredible proud. I wasn’t even supposed to be there, I finished 9th in the North Carolina AOY program and somehow I came out and finished 39th out of over 360 of the best anglers in the country. I had hopes and goals of finishing in the top 50 but hopes and reality normally never cross paths. My persistence, analysis of marked fish positions, and translating those positions into patterns and new locations is what enabled me to finish this high. In conclusion, this story is not over; my top 40 finish gave me an automatic qualifying spot for the 2018 KBF National Championship, which has a guaranteed payout of $100,000.00 for first place. I have already started studying what produced this year and translating that into a strategy for next year, and I am hopeful I can finish in the top 25 next year if I better target those structure points and lake features. Thanks for sharing in my memory of this event. It was quite a journey, and proves we should never count ourselves out—dreams are worth chasing! The pre-spawn chaos can be overwhelming, the search for big bass and that lifetime trophy are in full swing, and fishing pressure will just get heavier as each day passes and the water temperatures warm. 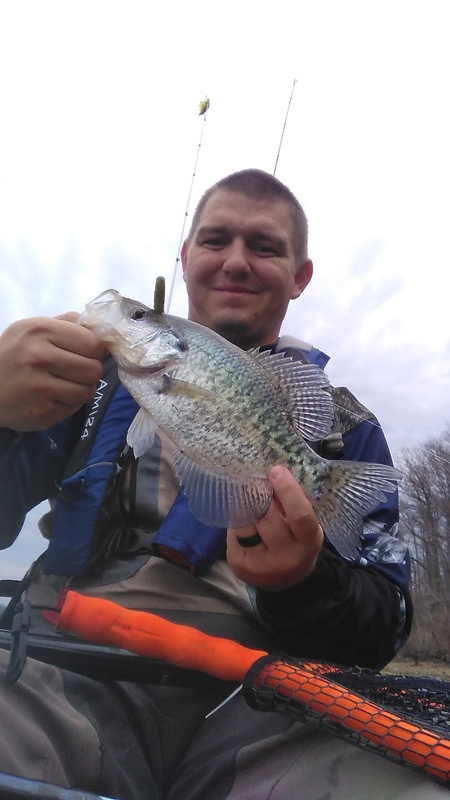 The pre-spawn patterns make some fishing days great, while rapid changes in weather due to frontal systems and high pressure can leave anglers wondering where all of these aggressive fish went in such a short amount of time. Here are my four tips of targeting pre-spawn patterns and catching your fish of a lifetime. The wacky rig was for a long time in my life something I knew about, but I had never really had too much luck with it. This all changed about two years ago on a hot summer day, when I hooked up a wacky rigged Yum Dinger and began skipping and flipping it under docks and overhangs with incredible results. Since then, I have become what some of my friends call Mr. Wacky, I really focus on this presentation because there’s not a lot of people who consistently work and target fish with it at various depths. What I mean by this is everybody throws a weightless wacky in the summer, but I throw them on weighted jig heads in Pre-Spawn, various weighted hooks in summer, and once again in fall and winter. Whether I am targeting fish in the shallows, or fish in 15-20 feet of water, the suspending presentation of this lure is hard to beat. My one two punch consists of a Zoom Super Fluke, and a Yum Dinger, both in watermelon red. I will work one bait presentation for a set amount of time, and then double back over the same area with the follow up bait. Which one goes first and which one goes second is never a set thing, but what is certain is the follow up bait produces bigger and more fish over the same worked area every single time. 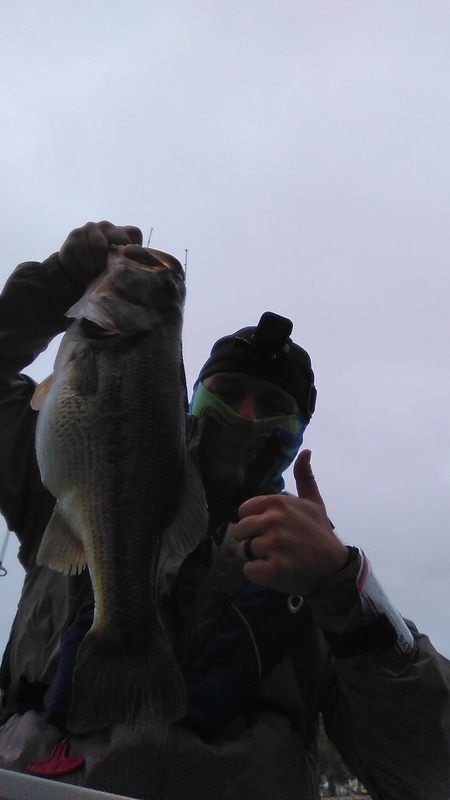 To the point that on Kentucky lake I have worked behind 3-4 bass boats on the same shoreline and consistently pulled off 2 – 3lb bass right behind where 3 other boats just worked. Having a one – two punch combination is crucial to consistently producing good bag limits in limited amount of time during tournaments. We all see big bass cruising the flats this time of year and want to target those big flat areas in hopes of enticing a monster. But when you really look at productive approaches, and where the majority of fish stage this time of year, you will realize that targeting the flats is highly ineffective unless you are specifically targeting beds. I have noticed that I consistently produce bigger bag limits when I switch from the flat areas, to directly targeting the drop offs and sloping banks adjacent to these flats. The word drop off doesn’t always mean a large drop in depth to me, I consider a 2 foot flat that drops down to a 5 foot area a drop off, and that is what I really focus on this time of year. I look for a 1-2 foot water depth up against the bank that has 5-10 foot water within 10-20 feet of the bank. This terrace-like feature is a money maker during Pre-Spawn through Post-Spawn patterns when worked with plastics and top waters as the water warms up. Just remember the fish are very active during this phase and while they will be cruising and searching for an area to spawn they are also creatures of habit and will remain in the same general depth/feature patterns throughout this spring. The bass moving up to spawn follow very specific and predictable patterns, frontal systems and rapid weather changes will alter the fish’s behaviors and predatory behaviors in terms of aggressiveness and what they will strike at and why. But unless that water temperature rapidly drops more than 5 degrees and stays that way for over 7 days, the bass will not retreat back to the primary points and deeper water unless they absolutely have to. Fish are efficiency minded creatures and will not expend energy or perform big changes in location if they don’t have to. If you are catching fish in a cove ,or on a primary point before a weather change, target that same area after the weather change but change up your presentation and move just a tad bit deeper. If the fish were holding in 2-4 feet of water move to 6-10 foot marks and target that area of the drop off or cove. Changing up from crank baits and bladed baits such as spinner baits or chatter baits, to a more subtle approach like a Carolina-rigged worm, or finesse bait like a fluke or stick worm can be absolutely game changing in terms of fish production. This might sound “corny”, but always think, if I were a fish how far would I go to use the least amount of energy and still be better situated for the changing weather. At the end of the day different water bodies produce different patterns and bait presentations during this time of year, but understanding how the fish think and how you can make change-ups to better approach these fish can have huge pay offs during the springtime. Stay safe, always wear a PFD, and don’t forget to fill out a US Coast Guard float plan to leave with a friend or family member in case you are late, so authorities know where to start searching for you. This single sheet of paper could save your life. Pre Spawn Curveballs and how they will catch you more fish. In baseball after a few fastballs thrown at a batter, a curve-ball can throw everything off and lead to a mistake, this post is about throwing a curve-ball at Pre-spawn bass and how it can help you catch more fish. With the spring weather starting to warm the waters, and cold fronts becoming less frequent, the Pre-Spawn stages are here. The Pre-Spawn stages and patterns are generally initiated when water temperatures average 50 degrees to 55-ish degrees Fahrenheit. The bass will start to move from the deeper winter staging areas to the transitional zones between the winter areas and their spawning areas. One thing to keep in mind is every body of water is different, a lake with a maximum depth of 50-100 feet is going to be a completely different strategy to target this water temperature than the rivers and creeks I fish, that max out around 15 feet. Transitional areas are generally 8-25 feet deep depending on the depth of your water body. Bass will spawn in anywhere from 2 feet to 12 feet deep depending on the water level fluctuation of your area and the water temperature swings of the current season. The reason for that is the water at deeper spawning flats stays more consistent than the faster temperature swings from the surface down to 2 feet. Targeting Pre-Spawn bass is one if the highlights of bass fishing, the bass are extremely aggressive and at their heaviest weight when they are fully stocked from a spring of feeding to get them through their spawning cycle. 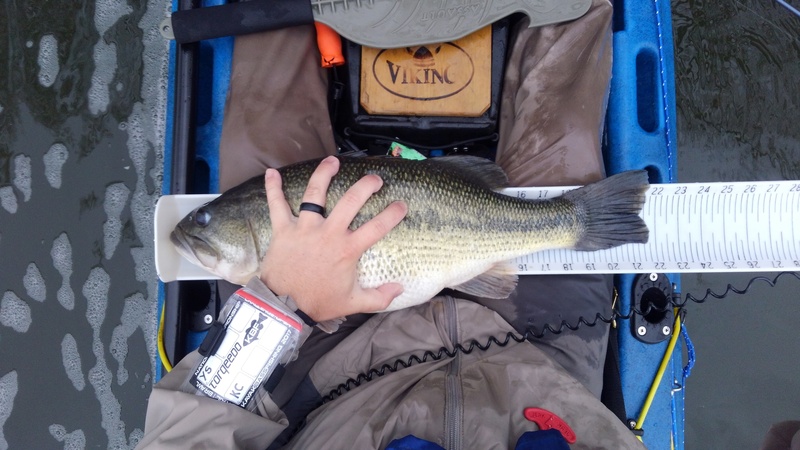 Its not uncommon for the same bass to weigh 3 lbs more in the Spawning season than if you caught that same bass in the summer. Most people will target Pre-Spawn bass with crankbaits, spinner baits and Alabama rigs. This tactic of imitating a fast-moving baitfish produces some great numbers of fish and will be consistent until the bigger fish start bedding down. However, everybody and their mother is going to be throwing those three bait styles. The fish this time of year will be heavily pressured because it is one of the best times to get out and catch a trophy fish and quite possibly the fish of a lifetime. And here enters my strategy. During this phase I will use some crankbaits and spinner baits, and even a jig occasionally, but my main tactic is a finesse approach. I almost always throw a wacky rig, weightless senko and fish it between 6-18 feet deep. To say this bait sinks slowly is an understatement, a weightless senko falls at a very slow rate through the water column and provides a wacky rig action that when fished correctly can be absolutely the most productive bait in your tackle box. In the last two weeks, I have made 3 trips that are about 3-4 hours a piece. I have averaged 10-12 fish per day and so far, landed a 6.5lb and 5lb bass this week alone. Everyone else in this river is throwing fast moving lures targeting big aggressive fish but they forget that the fish see so many crankbaits and so many patterns that they are very skittish of a fast-moving rattling bait. The river I fish doesn’t have huge schools of shad, it doesn’t have large schools of minnows that are balled up like other reservoirs, these fish attack a slow moving senko much more aggressively than crankbaits and most people don’t even associate fishing a finesse rig this time of year. I am very fortunate that my job takes me to many unique places. I have stood at the base of the Gulfoss Waterfall in Iceland, Stood on the gravel runways of Greenland, and walked miles and miles on Central American shorelines. These travels have mostly been in Costa Rica, waters known for the elusive and highly sought after Rooster Fish. I have stayed over 4 months working in Costa Rica over the last 4 years, and have always fished from the shores trying to catch my dream fish. I could have paid for a charter but something about having to battle this fish on his turf, with his rules seemed like more of a challenge. This assumption proved to be accurate as day after day, week after week I would find Needle Fish, Jacks, Trigger and Snapper, with the Rooster remaining but a ghost creeping along shoreline. I have thrown everything from top-waters to spoons, jigs to twitch baits and even a handful of suspending jerk baits at this ghost, with only other gamefish to prove for it. This brings us to the interesting part of this story, For the last week the weather was nice but the winds were from the east at 15-25 knots, making shore fishing very difficult, and to give you a better understanding of the environment here, the tide change is about 8.5 feet. In terms of shore fishing, high tide is borderline impossible because the waters in castable distance are rocky and very shallow, but when the tide recedes you can walk out on the rocky points and be within 5 feet of the 20-30 foot drop off the fish cruise for their food. I was lucky enough to get a few days off starting on January 1st, 2017. The morning was cloudless and wind was surprisingly light and never really manifested at any point during the day and I had the tide to my advantage. I wandered about a mile down the beach to a point that juts out into the bay, a spot where I had caught a 30 lb Jack the year before. I had tied on a Zoom Magnum Fluke in white color, to a 3/4 once jig head for casting distance. And prepared my drag for the hopeful battle that was to follow. My first cast was perfect, just on the edge of the rock shelf and in a school of bait, I knew for sure i would hit a strike, yet rod jerk after jerk nothing happened. I wound up to make a second cast when my lure hit a rock behind me and went off away from the school of bait and into the blue, I gave my lure two twitches then felt the hit and line slack out, I reeled down and set the hook to feel the rod surge and drag start paying out and I knew I had a good fish, needle fish are very streamlined and fight in bursts, this fish I could feel the tail swimming side to side with my rod movements and knew there were two options, a jack or a rooster. Throughout the fight I was hopeful it was a rooster but in the back of my mind the odds were racing and I knew it was probably another jack, and then as it got closer to the rocks I saw silver, then a stripe, then the feathered spines that are the calling card for this fish’s beauty. I lost my mind! On the end of my line was a fish I had been chasing over the last 4 years, that I caught on my own without a guide and from the rocky shorelines in Costa Rica on artificial lure. As I got my fish grips in its mouth I realized the hook had dislodged from its mouth during the fight and hooked the top of its head. I had caught my lifelong dream by about 1/4 inch of skin on this things head. After the healthy release I got to watch this beautiful fish swim up the shoreline feathered spines above the surface and knew that I had battled this fish on his terms in his waters and had won. But in the end releasing the fish into the water and watching it swim away was almost as good as the hunt and fight the preceded it. Here’s the funny part, I was told by a friend that 2017 was the year of the rosster, and I caught this fish on the first day of 2017. In conclusion, I think that’s what we all seek when chasing our fishing dreams, are we really looking for that fish or are we looking for the challenging path and work leading up to catching it. Thank for reading and I hope you enjoyed this story 4 years in the making. the video of this story is below. Enjoy! When it comes to fishing, most of us thought that no woman could ever impact our love for fishing or our abilities to fish when we wanted. Songs like Brad Paisley’s “I’m gonna miss her” can pretty much sum up how we feel about giving up fishing trips. But if there is one thing I have learned in my marriage is that it might not seem like a big deal to you, she is upset that your going fishing instead of spending time with her, even if it’s just a little and it barely shows on the outside. Over time it adds up and eventually turns into a big problem. My problem was when my wife was pregnant I felt like I had to fish as much as I could anytime the weather allowed, because I felt like once my daughter arrived that was all she wrote for me and my fishing habits. I knew she was frustrated that I was fishing so much but it didn’t seem like it was really bothering her so I kept on fishing. Once my daughter arrived I realized it wasn’t the end of my fishing life and I could easily go out once a week without getting on her nerves but now my finances had changed and things were quite different, resulting in no money in the budget for lures, bait or gas money to go fishing. Instead of realizing this, I continued to push the issue so I could fish like I wanted. Unfortunately, this habit put strain on my marriage and finances. What took me a while to realize is I was trying to change my financial habits and priorities when it came to spending time with my family, all while changing as little as possible. If that sounds stupid, it’s because it is! I ended up realizing my problem before it seriously affected my marriage, I took a 6 month break from fishing, sold my fishing kayak and focused on getting our finances in order and building a strong foundation in my marriage. What is amazing, is after those 6 months, my wife came to me and asked if I wanted to buy a kayak and start fishing again. Because I had gone out of my way to change and show her I was serious about our marriage, she went out of her way to make sure I still get to enjoy my hobby and love for the outdoors while fishing. In the end, I have a strong marriage, because I finally realized that fishing was my hobby, not my life. My life was my marriage and my family. Fishing was something I got to do on the side when there was time and everything at home was in a good place. No fish was or ever will be worth my marriage.